Double torsion springs are basically two single torsional springs which are connected by a strand of wire in the shape of an arch. They are used when additional force is needed but may be turned into single torsional springs by making certain alterations to the physical dimensions. Torsional springs are a part of our everyday use whether you have it working in a ramp, hinge, clothes pin, etc. Double torsion springs are also seen in common devices but, when it comes to manufacturing, they are a less economical option. This is why at Acxess Spring we will work with you to convert a double torsion spring design into single torsion springs and save you a great amount of money. Spending Too Much Money on Double Torsion Springs? 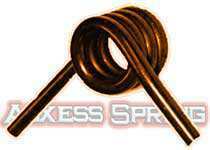 Double torsion springs are wound and manufactured in one and each set is wound in a different direction. This makes manufacturing these springs a complicated task therefore costing you more than it would to purchase a regular torsional spring. 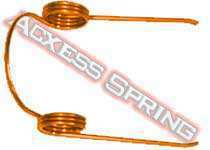 Single torsion springs are usually an easy set up depending on the spring index and whether you would like any custom modifications such as bends on the legs or perhaps you’d like for it to work as a torsional compression spring by adding some pitch in between the coils. 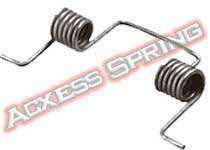 Double torsion springs are basically two torsion springs working in parallel. This means that they will exert more force but, in some cases, you might be able to redesign the spring into a single torsional spring by making certain adjustments to the physical dimensions like increasing the wire diameter, decreasing the outer diameter, or subtracting coils. You may also simply turn it into two single torsional springs as shown on the banner of this page. 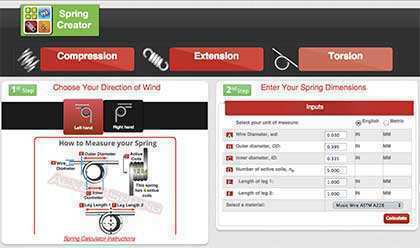 To replace your double torsional spring for a single torsion spring you may use our spring calculator and calculate the force of your double torsion spring. This is done by inputing the dimensions of only one set of the pair of torsion springs that make up your double torsion spring. Once you do so, multiply the torsion spring rate by two. 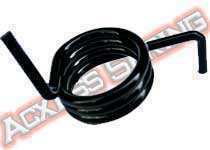 This will give you the total spring rate of the full double torsion spring so that you may base your new single torsion spring design on those values. Start Designing Your Single Torsional Springs Now!